The Ennis Sisters from Newfoundland (Maureen, Karen and Teresa) haverecently released their new 12th CD entitled, Keeping Time in June 2018. 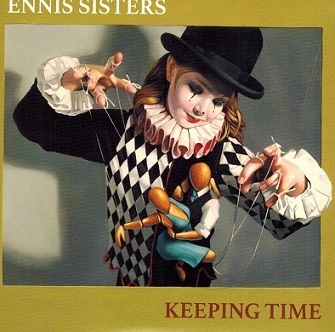 The Ennis Sisters conjure legacy with their latest offering, Keeping Time. The CD is a Collection of 11 songs, and is a concept album that honoursand preserves our most precious gift--time, and what we do with it.The Ennis Sisters earned a Juno Award, a SOCAN Award, multiple East Coast Music Awards, and Music Newfoundland and Labrador Awards. The album was produced by Alan Doyle (Great Big Sea) and he had a handin co-writing a couple of the songs, Wheels and Meant To Be. Maureen wrote the songs, Own Sweet Time and Sunken Garden and co-wrote 8 others. Keeping Time is reflective yet uplifting, as the album is about keeping time in both life and music. Inspired by the unraveling and tethering of memory,Keeping In Time is part homage, part celebration of life, as the album honourstheir father John, who they recently lost to dementia. He was the girls greatest supporter through thick and thin. He was their superman-always going above and beyond. Many incredible musicians helped The Ennis Sisters with the music, such as Alan Doyle, Cory Tedford, Kris McFarlane, Mark Murphy, Aaron Collis, Kendel Carson and many others. The album was recorded at The Sonic Temple Recording Studio in Halifax, NS and at Skinner's Hill Music in St. John's, NL. The album certainly will be a welcome addition to anyone's music library says Atlantic Seabreeze and a five star rating out of five stars for Keeping Time.We can forsee many award nominations and awards for this album. The girls shine throughtout the album and their music is incredible as it blends in withthe beautiful vocals of the girls. For information regard the Ennis Sisters and their music, refer to their website, address posted above.